The organisers of Africa Fashion Week London and Côte d'Ivoire Fashion Week have partnered to promote African and African-inspired fashion and design talent as well as each others events on all their platforms. Now in its second year, the Côte d'Ivoire Fashion Week takes place on 23 December at the Historic City of Grand Bassam (National Costume Museum) in Abidjan under the theme ‘Ivorian Textile Products on the American Market’. Founder and CEO of Côte d'Ivoire Fashion Week and World Fashion Organization Ivory Coast National Chapter chief representative Coulibaly Severin said: “As Côte d'Ivoire Fashion Week takes place in Abidjan, a city considered as the cultural crossroads in West Africa, we have to contribute to the success of this project and consider Africa Fashion Week London as a part of ourselves. 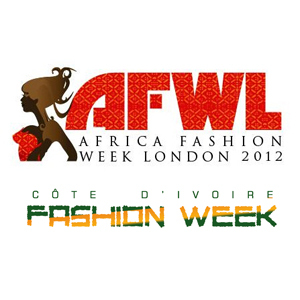 In return, Africa Fashion Week London, which is currently preparing for its third edition in August 2013 will support Ivory Coast designers to showcase at their event and provide them with an international platform. “AFWL's aim is to promote emerging and established African designers and African inspired designers from across the globe which is what we intend to do with our partnership with Côte d'Ivoire Fashion Week,” said founder and CEO of Africa Fashion Week London, Ronke Ademiluyi, about the partnership.